← A Call For Art! Have you ever wondered about the stories behind some of this world’s crazily named plants? Say the R. ‘Champneys’ Pink Cluster’ or R. ‘Blush Noisette’? Well Dr. Armitage did, and went on a journey to find out the backstories. Legends in the Garden introduces some 46 people, some familiar and others not, as well as places associated with popular garden plants.If you’re interested in hearing those tales, head over to Cobb Galleria in Atlanta on Sunday, Feb. 27th to hear Dr. Armitage share some “Tales from the Garden” at the Southeastern Flower show. 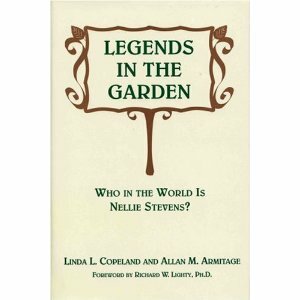 If you can’t make it, consider buying his book Legends in the Garden for an informative and entertaining read. Happy Learning!